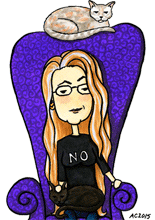 I decided that, since I am clearly going to keep experimenting with the imperfect art of hand-drawn repeating patterns, I might as well just call it a series starting with this one. This was drawn with my favorite scribbly fountain pen on archival comic backing board, and then shaded with a waterbrush to carry the ink throughout the pattern. It reminds me of some of the patterns on the dwarves’ clothing in The Hobbit, geometric and individual but not too complex. 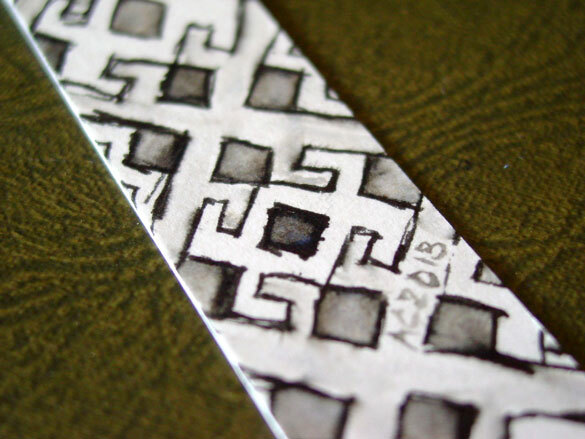 Pattern Bookmark 1, 4.5″x1″ pen & ink on paper, nfs (sold). Above, you can see a close up of the middle section of the pattern, containing almost one whole repeat though it goes off the edges. 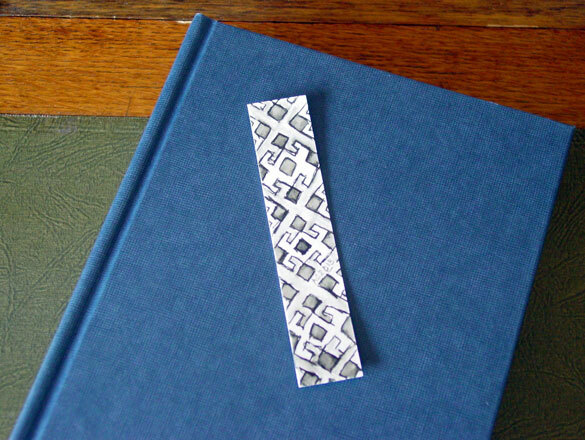 Below, you can see this bookmark with a hardcover book, looking quite petite.